I’ve enclosed a picture taken on the Golden gate Bridge in San Francisco. 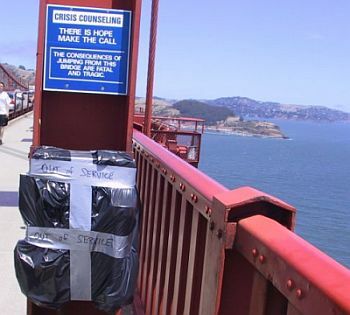 Notice that the sign that’s in the picture …“THERE IS HOPE MAKE THE CALL” …is placed there to help, and possibly deter, people thinking of ending it all by jumping off the bridge. I am inclined to believe that the sign was placed on the bridge with good intent. Clearly, in a world where some people think that the common sentim ent amongst people is indifference, the sign seeks to overcome the feeling that nothing is worth it and nobody cares. The question becomes is the sign too-little-too-late? If I were to come up with a sign that was the equivalent in portfolio management, it would say, RISK MANAGEMENT, IT’S NEVER TOO LATE. Managing your own money or other people’s money inherently raises a question of “what are we doing about risk”? The problem in the area of risk management, is that the words “risk management” mean something different to everyone. One possible definition of risk management could be: the evaluation of financial risks, together with the identification of procedures to avoid or minimize their impact. The definition is nice because it’s very broad. Which means it can pull within its “umbrella” a whole host of ideas. In the same way that a sign says, “THERE IS HOPE MAKE THE CALL”, a sign that says, “RISK MANAGEMENT, IT’S NEVER TOO LATE” is both vague and specific at the same time. So for example, the word “hope” covers a lot of ground. What is missing is the specificity of the word hope as it applies to an individual. Hope could mean everything from, getting a new job, to a cure for a disease. So if we were to change the sign from, “THERE IS HOPE MAKE THE CALL” to “THERE IS HOPE, MAKE THE CALL, 800 555 3456, FOR A NEW JOB”. The specificity of the hope makes the resolution of the problem all that much more real. It’s the same with risk management, the more specific the steps that will be taken, when a change in the market requires action, the more confident you will be that you’re doing the right thing. So for example: “if the relative strength for bonds exceeds the relative strength of stocks, reduce the percentage of stocks in my portfolio by 15%”. This is very specific, based upon two specific actions. Action number one, relative strength of stocks is exceeded by the relative strength of bonds. Action number two reduce the percentage of stocks owned by 15%. Okay let’s return to the picture. Notice that the third warning in blue says, “THE CONSEQUENCES OF JUMPING FROM THIS BRIDGE ARE FATAL AND TRAGIC”. Establishing risk management procedures, that are both specific and meaningful are the resolution to something that financially could be “Fatal and Tragic”.